Today, anger is sweeping the country. 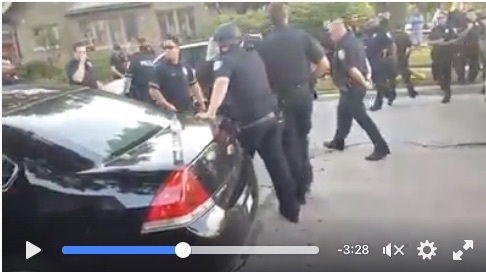 I watched a video of a group of black youth in Milwaukee confronting the police. “Don’t touch one woman,” they said. “None. Not a one.” Eventually the police backed down and retreated down the street. We all have something to learn from the fearlessness of these youth. It is that spirit that will transform society. Along the way, it is that spirit that will build a real, mass working class party. * It is that spirit that the Stein/Baraka campaign must appeal to, not just in words, but in action. 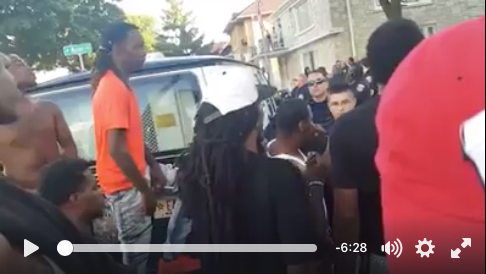 Black youth confront cops on a Milwaukee street. These photos are from the video from the Facebook page of The Many Faces of Vaun. Only to be followed by the youth, who confront them again. The presidential election campaign of Stein/Baraka should be transformed – should “reset” itself – into a mass organizing campaign. 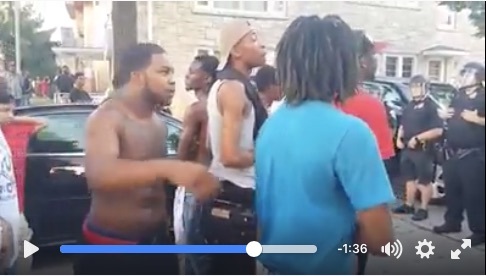 They should be going to all the hotspots around the country, including Milwaukee, right at the forefront, confronting the police and helping these youth publicize what they are experiencing every day. On that basis, they could be really building a fighting political party, one that not only speaks good ideas, but organizes the fight against this rapacious capitalist system. There is another thing to consider: Already big business is talking about passing the Trans Pacific Partnership (TPP) after the elections, during the “lame duck” session of congress. Nobody (except for the tops of the capitalist class) knows exactly what is in it, but we do know that it is a major threat to worker rights, the environment, etc. Rather than just talk about this issue, the Stein/Baraka campaign should be organizing a true mass opposition to it, building community/labor groups that are prepared to go out into the streets and shut down every major city in the country as soon as the US congress starts to officially consider this treaty. Now, that would be a real workers’ election campaign! * – I can’t find that video on youtube, but if you go to the Facebook page of oaklandsocialist, you can find it there. If we can find the video on youtube, we will edit this post to include it.